Hi guys I was wondering what you think about the chances of Toei adapting the side stories for Crystal. I for one agreed with many people that Casablanca Memories should have been adapted to be an episode in season 1. I would like for all of the side stories to be adapted along with Codename Sailor V but given how poorly it is received I honestly don't know if we will get anything after the Stars arc or if we will even get Stars after the Dream movies. 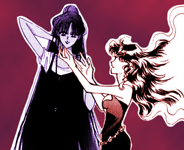 One thing I would especially like to see is Parallel Sailor Moon. 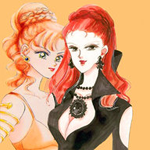 I would love to see what Kousagi and her Senshi look like in color. I would really like if she had the same color scheme as the design Marco Albiero gave her with pink and yellow as her color scheme as it looks great on her. Toei can barely manage to get out adaptations of the regular manga chapters. I think the chances of their adapting the side stories or Sailor V are slim to nil, and the chances of such adaptations being good if done absolutely zilch. Unless they were extra the chance them being animated is slim to none assistance. Even if Toei would release Crystal without these problems we have i still would think they wouldnt do side stories except for maybe Sailor V. The side stories are just way too random. They're not a series (even Chibiusa's diaries are hardly a series) and they happen across all arcs so i dont see Toei doing that. If Crystal wasnt 1:1 adaptation then they'd probably be included in the series but with the format we've got i dont see it ever happening. Sailor V is a bit different so MAYBE. Its not as random as SM side stories so the only issue is if Toei would be willing to do it. Ami's First Love - The short special that premiered before the SuperS movie. Problem solved....for half of them anyway. I wonder why Sailor Moon's side stories are never adapted when other shows have their side stories adapted or movie spin off? I wonder why Sailor Moon's side stories are never adapted when other shows have their side stories adapted or movie spin-off? I don't want to ignorant, but I have always thought that the full colored manga is non- Japanese versions done by companies themselves to make it closer to comics, a practice from the 90s to mid 2000s that cannot be considered cannon. I might be very wrong and if so - I think it will be a lovely idea.